Perfectly pairs with Beringer Founder’s Estate Cabernet Sauvignon. 1. Bake tart shell at 400ºF for 20-25 minutes until golden brown. 2. In a large pan heat 1/3 cup olive oil over high heat. Add eggplant and zucchini and cook until browned and cooked through. Remove from pan and set aside. 3. Add 2 Tbsp of olive oil, garlic, thyme, olives and onion to the same pan and cook until soft. 4. Add peppers, diced tomato and paprika and cook for 2 minutes. 5. Deglaze pan with Beringer Cabernet Sauvignon and cook together for 5-7 minutes. 6. Fold in eggplant and zucchini and season with salt. 7. Cool filling slightly on a sheet tray. 8. Slice heirloom tomato very thinly. 9. 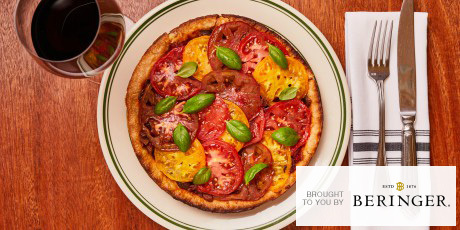 Fill tart with cooked vegetables and cover with tomato slices. 10. Bake at 400ºF for 20 minutes. 11. Remove from oven and garnish with basil.